An assistant of an American missionary American missionary. Rev. Issachar Jacox Roberts (1802-1871) in Guangdong heard of the activities of Hong Xiuquan and invited him to pay the missionary a visit . 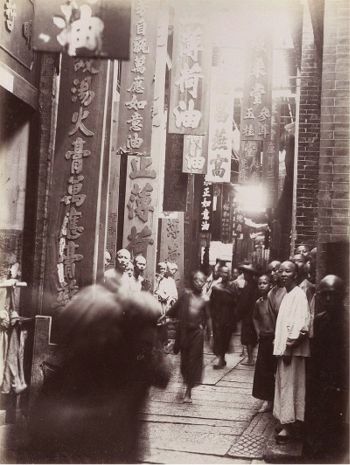 Mr . Roberts arrived in China in 1837 and spent his first five years worked among the lepers of Macao, and at this time was living in Guangdong . Robrts became the first Westerner to live outside the protected foreign factories and opened a mission in Canton ( Guangzhou ) callled the Uet-Tung Chapel, which was located by the waterfront . This chapel would bethe only western Christian church Hong ever attended . Rev. Roberts died of Leprosy in 1871 . 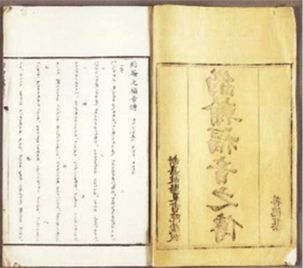 Upon the reception of this invitation, Xiuquan, taking with him his friend Hung-Jin, went to Canton, and presented himself before the American missionary. Rev. Roberts describes Xiuquan as about about thirty-four years of age ; was five feet five inches in height ; and in person was muscular and broad-shouldered . Presenting, on his introduction to Mr. Roberts, a detailed account, in writing, of his life and visions, he was received into good fellowship, and introduced to a number of persons more or less connected with the mission. For about two months starting in March 1847 he traveled to Canton receiving instruction from Mr. Roberts . It is here Xiuyuan was introduced to both Old and New Testaments in the Gützlaff bible, the Doxology or short hymns of praise and the Ten Commandments adopted by the Taipings and would be repeatedly printed by the Taipings later. Xiuyuan also participated in hymn singing while studying with Roberts, which would also be used by the Taipings . This was similar to the chanting done by Chinese scholars to memorize texts . 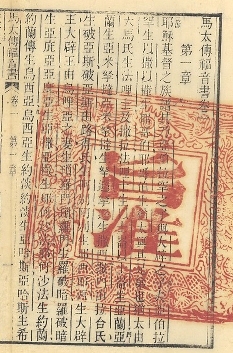 Xiuquan was on the verge of being baptised when, according to Wang Tao , Xiuqian was tricked by a jealous assistant of Rev Roberts to ask for a small stipend . This assistant was afraid the higher educated Xiuyuan would take his job . Rev Roberts then began to doubt Xiuquan's true motives, considered him a possible 'rice Christian" and refused baptism . Without baptism Hong had no chance to earn a living and to work as a native preacher.Roberts later visited the Taiping capital in 1860 and made a vice foreign minister, but left in 1862 dismayed at how the Taiping version of Christianity differed from his own and apparently had a disagreement with Hong Rengan's brother and became a critic of the Taiping movement .Rev. Roberts died of Leprosy in 1871 . Though utterly destitute of the means of traveling, this circumstance did not prevent his resolving to make another visit to his converts in Guangxi. Accordingly, Xiuquan soon reached Thistle Mountain, but learning there that his friend, Yun-shan, was then successfully preaching in nearby, he immediately went thither to see him. The meeting between the two friends was a happy one ; and Xiuquan was delighted to find a congregation of God-worshipers, already numbering upwards of three thousand . Upon his arrival, immediately replaced their former books with copies of the Bible he had brought from Canton . At this time Hong Xiuquan was already using the term Taiping 'Great Peace', which was later to be the name given on his rebellious movement . Xiuquan was going to establish on earth the heavenly Kingdom of Great Peace, a Tai Ping Tian Guo 太平天囯 . Feng-Yushan for leading the people to paganism and to revolt . This was the first time the God worshipers had come into contact with the state . Feng was able to argue that worship of Shangdi ( Lord or God ) had always existed in China and Feng was only ordered to leave Guangxi . Many members of this group, who now refer to themselves as the God-worshipers, are literate, but like Hong have previously failed their government examinations. In the spring of 1848, the God-worshipers are joined by Yang Xiuqing who will become the voice of God on earth. Hong accepts that it is his Celestial Father speaking through Yang voice, and that the voice of his elder brother, Jesus, comes to him through another member of the group, Xiao Chaogui. Both Yang and Xiao entered trances when they transmit these heavenly messages. It was also during this time that other members of the group began to have sudden fits in which they lapse into verbal incoherence while their bodies quivered and were bathed in perspiration. The movement had begun to take on a more mystical aspect, and rapidly became a threatening religious cult, rather than just another one of the secret societies present in China at that time. The mode of worship established at Thistle-mount borrowed most of its forms from Christianity, but still retained some of the practices of the old idolatry. The males and females of the congregation were seated apart from each other. In prayer, all knelt down facing the side of the house whence came the light, and remained, with closed eyes, while some one recited a petition in the name of the whole assembly. God was praised by the singing of a hymn, in which, however, there was but little melody beyond that in the heart.When converts were to be admitted into the congregation, the following were the usual ceremonies : Two burning lamps and three cups of tea were placed upon a table ; when a written confession of sins, together with the names of the neophytes, were read aloud, and this afterwards offered to God by being burned in the flame of the lamps. Convinced that sin originated in ignorance of the Ten Commandments, he wrote commentaries to apply each commandment to a situation on Thistle Mountain . Xiuyuan declared that God or ShangDi in Chinese was a universal god, not a foreign western god . The ancient Chinese had worshipped Shang Di properly, but when Shang Di was not worshipped properly, the country became weak and divided . Xiuyuan would show the way to reurn to the proper path . The question was then asked of the applicants for admission into the congregation, if they promised, "Not to worship evil spirits, not to practice evil things, but to keep the heavenly commandments?" This answered in the affirmative, they knelt down, and the person officiating poured a cup of water over each one's head, saying, "Purification from all former sins, putting off the old, and regeneration. "Even Xiuquan, himself, had come only gradually to the total disuse of the religious forms and ceremonies in which he had been educated. All their money and goods (later including what they plundered) were pooled into a treasury and then distributed equally amongst themselves. At first, he had placed the name of God on the wall instead of that of Confucius, and had continued, for a time, the use of burnt paper and incense-sticks ; and when, afterwards, he removed the tablet, as too much as savoring of idolatry, his mother-in-law remarked that it was a pity to do so, because, since the name of God had been set up, they had good luck, and had added another field to their plantation. He was, therefore, tolerant of those comparatively harmless customs of idolatry, which were, for a time, kept up by the weak in faith ; and contented himself with bringing his followers, as he had been brought himself, gradually to comprehend the more spiritual nature of the new religion. As the members of the sect went on constantly increasing, its leader at length felt strong enough to make an attack on some of the principal idols of the temples in the vicinity of Thistle-mount.